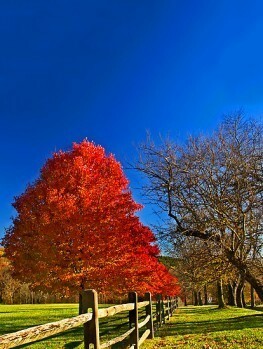 Everyone loves the fall, with its brilliant colors and mellow beauty. When choosing a shade tree for your garden, it makes sense to choose a tree with the best fall color, and the Autumn Blaze Maple is first choice for that. 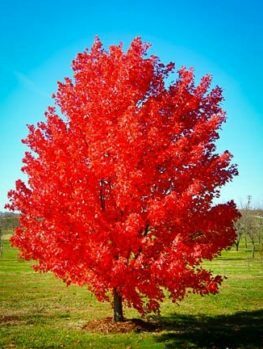 No other tree has the reliable and spectacular reds and gold of this tree, which is a vigorous hybrid bred from the native Sugar Maple and Silver Maple. 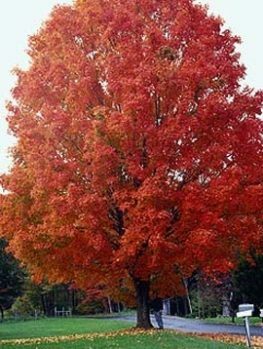 The Autumn Blaze Maple will easily grow up to three feet a year, so turns from a young tree into a mature tree in a very short time. It is hardy, reliable and largely pest and disease free. 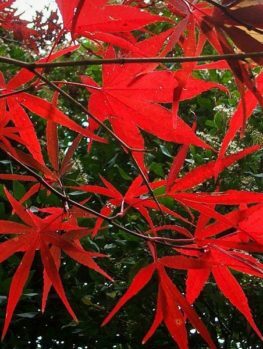 It is tolerant of urban conditions so it is a good choice for a town or suburban garden and its wonderful rich-red leaves in fall make it the ideal for any garden. Every garden needs a grand, mature tree – a proper shade tree that will grow with your family and be there for future generations to enjoy. Autumn Blaze Maple is an excellent selection for this purpose as it will thrive on almost all kinds of soil, from rich, damp soils, to dry soils and everything in between. 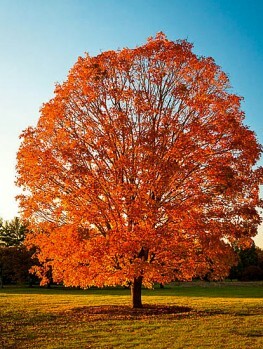 It is hardy and more tolerant of urban conditions than many other Maple varieties, such as the Sugar Maple. 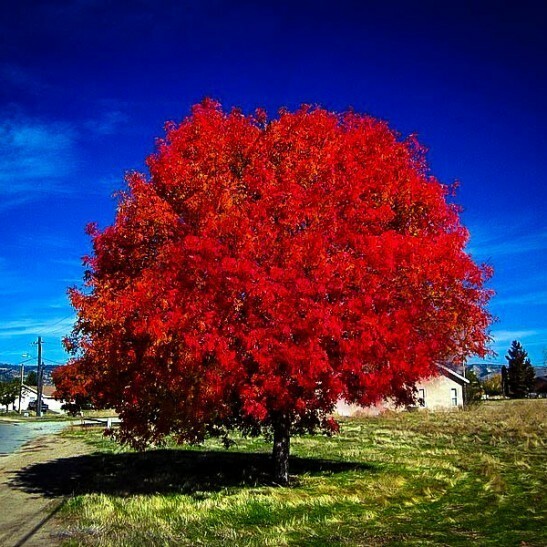 With its spectacular scarlet-red to orange leaves in fall, it is a tree that you will be proud to grow and that will be admired by all your neighbors and passers-by. Although often grown as a gorgeous specimen tree, Autumn Blaze Maple is also a great choice for a windbreak or deciduous screen, or even to make an interesting and beautiful hedge. 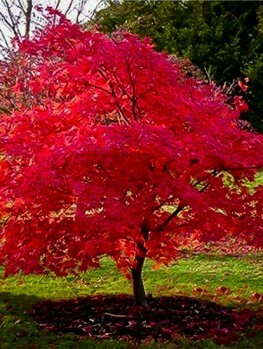 When young, your Autumn Blaze Maple will grow very rapidly, up to three feet per year, so it will quickly make a 20 foot specimen in your garden. As it matures the growth rate will slow down only a little and most trees reach a final height of around 50 feet in 30 years. Allow plenty of room for a specimen Autumn Blaze Maple. 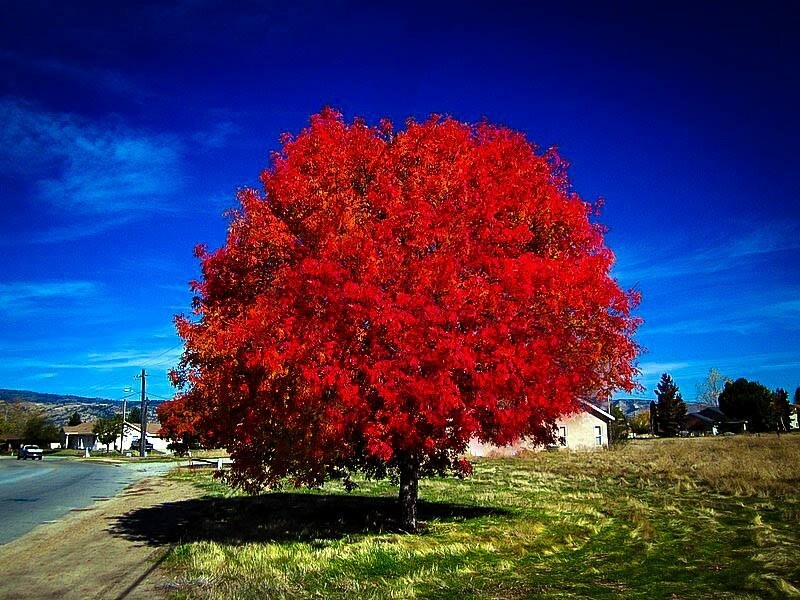 Plant your new tree at least 20 feet from your house and well away from driveways and roads. When planting as a screen or wind-break, allow 10 to 15 feet between the trees. A tree for life deserves a little care, so dig a wide, shallow hole about three times the diameter of the pot. Add some organic material like compost, manure or peat-moss and some bone-meal or superphosphate. Place the tree in the center of the hole, put back most of the soil and firm it down well. Add lots of water and when it has drained away fill in with the rest of the soil. Water well every week for the first season and after that only when the soil is dry. This tree can be planted in the shade of other trees but not too close to them. It will soon grow up and find the sunshine. It requires little pruning, just remove any weak branches and any that are growing too close together. Do this while the tree is young and it will have a good mature form and no problems will develop. Some water during drought periods and some tree fertilizer in spring in helpful for young trees but in a few years your tree will need nothing except admiration. 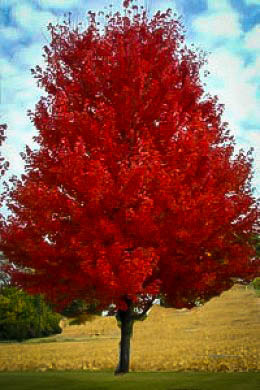 Autumn Blaze Maple is much hardier than other Maples and, in fact, many other shade trees. It is hardy in zones 4 to 8, so it grows right across America except for California, Florida, Southern Texas and the very northern most mid-west areas. This tree can beautify almost every garden in the country. This tree is tolerant of almost all types of soil, and will grow in locations not suitable for other Maples, such as urban areas. This is the most drought-tolerant of all the Maples, and is grown even in Australia where drought is a way of life. It will certainly grow faster if you give it regular water and some fertilizer during its first few years, but after that it will thrive on its own under almost any conditions. So whatever type of soil you have, this tree will thrive. It is resistant to insects and diseases and the strong wood will not break in storms. It is only occasionally eaten in winter by deer, and once grown tall will of course be out of their reach. Autumn Blaze Maple (Acer x freemanii “Jeffsred”) is a hybrid which combines the fast growth rate and hardiness of the Silver Maple (Acer saccharinum) with the strength and beauty of the Red Maple (Acer rubrum). 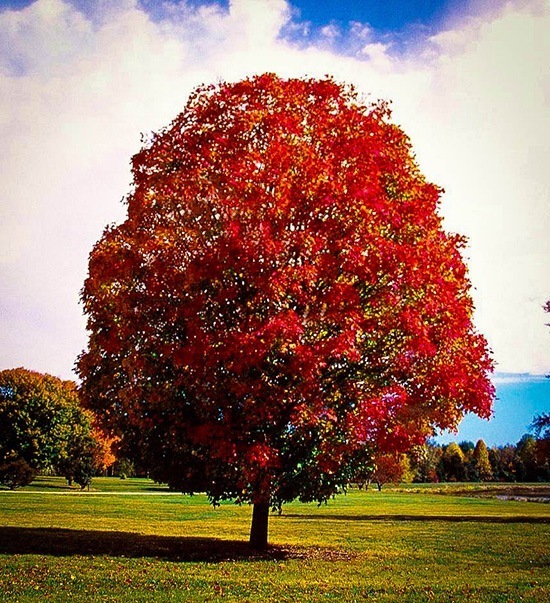 It can easily grow of up to 3 feet within one year and yet develops into a noble, long-lived tree with spectacular fall foliage in brilliant scarlet and orange shades. Unlike some other fast-growing trees it will live for many, many years and will grow 40 to 55 feet tall. It will develop a dense, upright, oval crown perhaps 30 feet across, so it is not as broad as many Maples and therefore takes up less room. The trunk has smooth grey bark when young and only in older trees does it become more ridged in appearance. The trunk may be 18 to 30 inches across. The leaves are deeply lobed and jagged in outline, very similar to those of the Silver Maple. The young buds are red and this tree rarely flowers or sets seeds, so it a much cleaner tree than many other Maples. 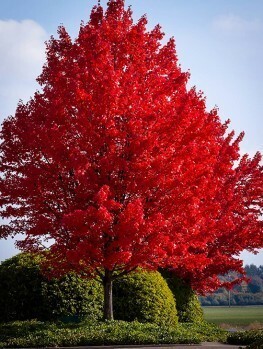 The most striking feature, and the reason why you should choose this tree, is the bright foliage each fall, in shades of red from scarlet to orange, which lights up the garden with perhaps the most spectacular display of any deciduous tree you can grow. There is only one Autumn Blaze Maple, so it is important to get a strong, healthy plant that will perform well in all conditions. Our trees are grown the correct way, from grafts of selected trees of the correct variety. That way every tree is identical to the original and will definitely have its best features. However, these take longer to produce, so avoid cheaper seedling trees that will only be a disappointment.